Completion is what everyone living on earth strives for and when it comes to fruition of pilgrimage in India, it could be achieved only after paying a visit to the holy city of Puri, located in the state of Odisha. The place is held for veneration of the Lord Jagannath, one of the many names for Lord Krishna, which is significant for being the only shrine with most of the prominent goddesses installed here; Ladha, Lakshmi, Durga, Sati, Parvati and Shakti. Every year, the 'Rath Yatra', a Chariot Procession is being carried from the famed Jagannath Temple to Shri Gundicha Temple at 3 Km distance. Idols of Lord Krishna along with the brother Balarama and sister Subhadra are being carried in the chariot taken from the temple of Jagannath. Huge crowd from whole country gathers here to give a hand in drawing the chariot. Some people getting so blind in their faith and devotion for the Lord, they try to come under wheels of the chariot, considering it a divine vehicle. The other reasons for the popularity of Puri include Govardhana Matha, one of the four 'maths' established Adi Shankaracharya in the four direction of India, others being Sringeri, Dwaraka and Jyotirmath. The Sun temple of Konark is another popular destination nearby, but this is not the only one. Puri is not the name people knew it with long time back. It was Charitra, as mentioned by a Chinese pilgrim but the interpretation is open to doubt and speculation. When Chodaganga Deva constructed the temple of Purusottama Jagannath with presiding deity Lord Krishna as Jagannath with his Brother and Sister, the place come to be known as Purushottam Kshetra or Purushottam Puri. The name then got shortened and 'Puri' remained of the full. Puri saw change in many hands administering it, from Mughals to British reign. There after till the present form of the Odisha was finalized, there were many regions in which Puri came and some that made Puri. Now, it has Puri Sagar sub-division. The place was selected for one of the monasteries propagating teachings of Adi Shankaracharya. Puri came to be known for the works done by the saint here and people who sought in-depth studies on Advaita Vedanta still come here. 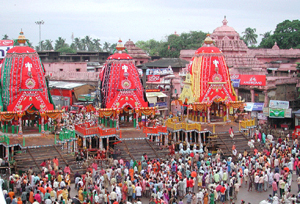 As far as Rath Yatra is considered, it is among the oldest and most crowded of Chariot Processions held in reverence of Jagannath - Master of the Universe. Jagannath is often believed to be the incarnation of Lord Vishnu, but this is not without multitude of discussions and interpretation of the events that happened in long forgotten time. Worshipped by the Shaivites and Vaishnavites, irrespective of the castes they belong, Jagannath is often said to be 'The One' source from whom various incarnations of Lord Vishnu and Lord Shiva originated. Beaches: The beaches of coastal Puri are much loved place where families of locals and tourists have a great time picnicking. The waters are considered rough and hence good for those who love surfing. 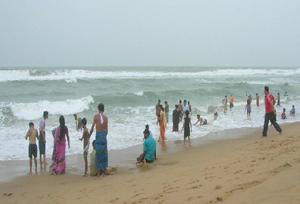 Two of the popular beaches are Swargadwar and Puri Beach. The former is considered holy while the latter is more of a relaxing zone. Shri Jagannath Puri Temple: The worship of Lord Jagannath in physical for is considered to have started from 10th century, strongly when King Ananta Varman Chodaganga Deva of Ganga Dynasty got this temple constructed in 11th century. 65 m high, the temple enshrines the deities Jagannath, Balabhadra and Subhadra. Markandeshwar Temple: Thought to be built in 13th century, the temple is dedicated to Lord Shiva and resembles to two other temples in Odisha, dedicated to Him - Vaital Deul Temple and Siddhesvara Temple. The deity of the Lord in 'Nataraja' form is accompanied by the idols of Mahishasuramardini along with images of Goddess Parvati and their son - Lord Ganesh and Lord Muruga. Chilika Lake: One of the most renowned birding sites in India is Chilika Lake which extends in Puri, Ganjam and Khordha. The salt water lagoon is known to be inviting many species of rare and migratory birds from India and other parts of the world. 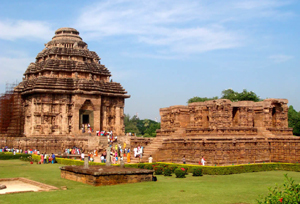 Sun Temple, Konark: Only 35 Kilometers away from Puri, one cannot avoid to pay a visit to this UNESCO World Heritage site while being in Puri. The temple is quite old built in 13th century, one of the finest examples of architecture where students of architecture come to seek inspiration from history and culture. By Air: The nearest airport to Puri is located in Bhubaneswar (60 km). From here, taxis or cars could be hired to reach and tour Puri. By Rail: The place is served by many trains coming from various towns and cities of India like Ahmedabad, Kolkata, New Delhi, etc. By Road: Puri is well connected with the other cities and cars, bikes and taxis could be used to visit nearby places as well.